Despite a dismal end to a once promising month of December for the Buffalo Sabres, there was still half a season of hockey to be played and although they were far behind a playoff spot in the division, the fat lady wouldn't be singing for quite some time. Especially in a division with as much parity as the Atlantic. The Sabres began January, 2017 against the NY Rangers and once again came out on top which was the beginning of a four-game point streak (3-0-1.) They proceeded to drop three of the next four before going on three-game winning streak in dramatic fashion. In three consecutive games they came from behind to beat Detroit, Montreal and Nashville in overtime which included a heavyweight goaltending duel between Buffalo's Robin Lehner and Montreal's Carey Price with Lehner making a phenomenal save in OT and much maligned defenseman Zach Bogosian clanking in a blistering slapshot off the post past Price on the next sequence. The Sabres seemed to be on a serious role and it looked as if they were on their way to a fourth consecutive overtime game in Dallas until some weird things began to happen. What wasn't weird at the time for the Sabres was going into prevent defense with at two-goal lead even if it was early as the first period like in Dallas against the Stars. 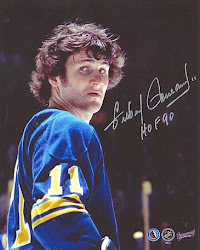 Or maybe for those of us in Sabreland it was a strange way of approaching the game while being two goals up, especially knowing the firepower Buffalo had when healthy. But for coach Dan Bylsma locking it down seemed to be his preferred method of coaching in those situations. It's what the Sabres did at home against Boston at the end of December and against Toronto earlier in the month of January. They did the same thing against the Stars as well and just like the other two games, they proceeded to allow four unanswered goals. The Sabres ended up losing to the Bruins and Leafs and eventually lost to the Stars 4-3, but not before controversy kept them from tying the score. With the Stars up 4-3 Buffalo amped things up in the third period eventually outshooting Dallas by a 16-2 margin. Unfortunately they were unable to get the game-tying goal. Or did they? Twice in the third period the Sabres thought they tied the game. On this one, with 8:53 left in the third period, Sam Reinhart wheeled in the slot and sent a backhand to the net that Kari Lehtonen stopped, although it looked as if he did so from behind the goal line. Jack Eichel was behind the net pointing to the puck over the goal line but an out of position, and slow to the scene, referee in Justin St. Pierre did not see it, and it was called a no-goal. “The puck was in the net,” Eichel said to the gathered media post game. “I mean, usually the puck goes in the net it’s a goal. It’s kind of weird how that didn’t happen. “The ref sees it in the net. I saw it go in the net as well. Then on the last one, that one might even be more conclusive. The puck clearly crosses the red. That’s two goals along with a lot of other things that happened during the game. It’s tough to put the outcome of something into the referees’ hands, but once again I think we get the short end of the stick there." When all was said and done, despite Lehtonen kicking a puck that was six inches over the goal line from out of the net, the evidence was inconclusive and the score remained 4-3 which is how the game ended and how they went into the All-Star break. After a four day All-Star hiatus, where Kyle Okposo skated in the All-Star Game, the Sabres got back on the ice presumably refreshed and on a high from the four games prior to the break, despite the no-goal calls in Dallas. They proceeded to get mauled by the Montreal Canadiens 5-2. It was an ugly finish to the month for Buffalo as the Canadiens made them look silly, yet the team still managed to finish with it's best month of the season as they went 7-5-1. Evander Kane was the star of the month as he lead the team with six goals and 11 points while upping is even-strength goal total to 13 on the year. Kane played on a line with center Zemgus Girgensons and right wing Brian Gionta and the trio contributed 14 goals and 13 assists with a cumulative plus-9 rating. 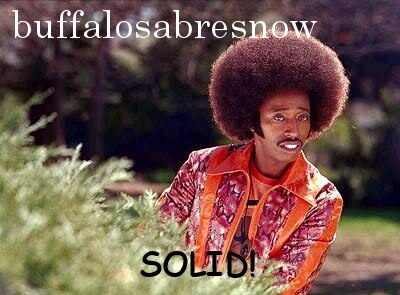 At the end of January the Sabres were nine points out of third place in the division and seven points out of the second wild card spot in the east. For their January team stats, click here, and for individual stats click here.